Posted on October 15, 2018 at 12:54 pm. Have you ever utilized a first aid service before? Do you know that such a service exists? Often times businesses attempt to handle the first aid and safety needs for their company by themselves. Perhaps this is possible when a company is small and has only a few employees. However, through the challenges of a company growing and becoming more viable in its industry, first aid and safety needs could begin to take a backseat, leaving them vulnerable. 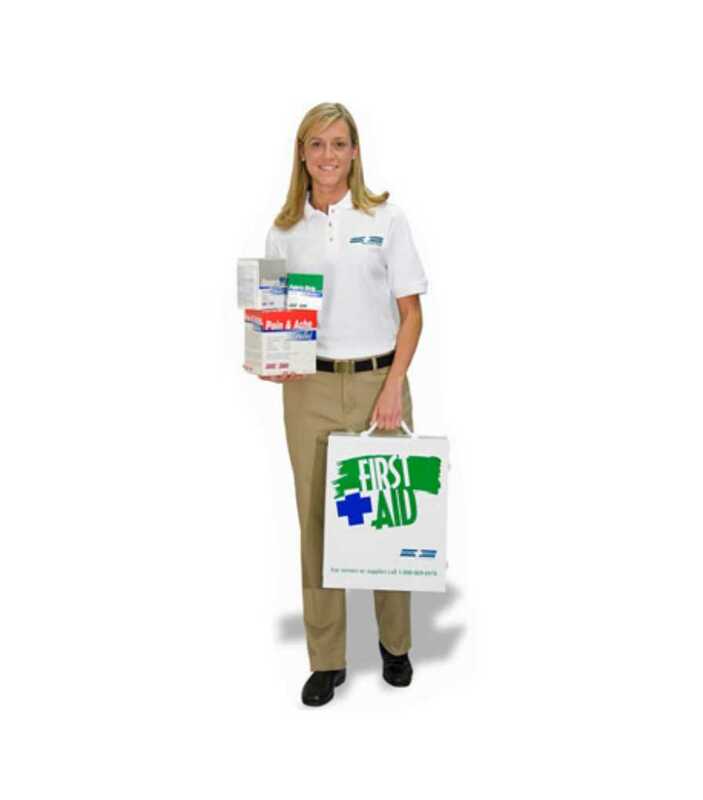 Having a first aid service company manage your first aid and safety needs can be very beneficial. Allow’s you to focus on your business, its growth and more complex issues that come with that. Ensure that you have an adequate supply of products to meet or exceed the latest A.N.S.I or O.S.H.A standards, and help you understand and comply with those standards. Having this service could also have a positive impact on employee morale and increased productivity. 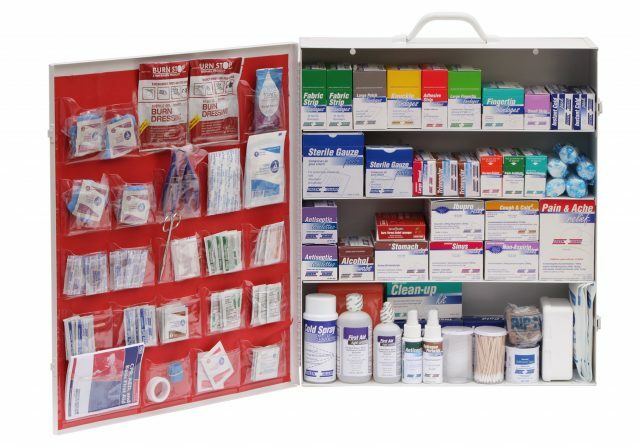 In this article we are going to go over the recommended fill list for an industrial first aid cabinet. Putting together a first aid program yourself that meets the above areas can be a real challenge. It could be difficult to source all of these items, especially in single unit dose packaging that helps to mitigate cross-contamination. Most items sold and purchased through pharmacies or large box stores are meant for personal or home first aid kits. A service company like Green Guard will meet with you and your team to design a program based on your needs and environment. 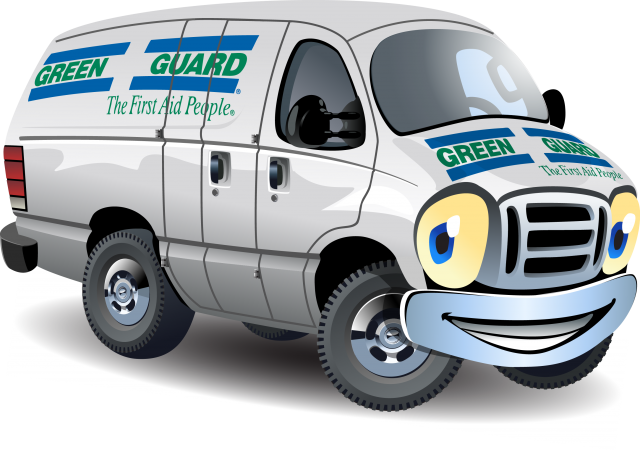 Knowing that your first aid and safety needs are being handled by professionals from Green Guard, will allow you to put your mind at rest and focus on other areas of your business. Posted on September 10, 2018 at 1:46 pm. See how Green Guard can help you and your business get more done. Posted on July 12, 2018 at 10:48 am. The workers surveyed reported visiting their company’s health/medical department on average 10 times per year. The top four worker complaints that occurred while on the job were headaches, colds/sinus problems, muscle ache/pain, and burns. 73% of those surveyed regularly experienced headaches and cold and sinus symptoms while at work. More than half (55%) of those surveyed experienced muscle and joint pain at work. Almost half (46%) of employees experienced cuts and burns on their skin while on the job. 89% of those surveyed believed the over0the-counter medications provided by the company helped them feel well enough to complete their shifts. University of Michigan workplace study sponsored by Medique Products. According to the Centers for Disease Control there are 358 million work-loss days each year related to acute conditions. Each year, there are more than 75 million work-loss days due to influenza. Contact a Green Guard representative today for a free consultation. First Aid Service – Why Outsource? Posted on June 4, 2018 at 11:52 am. Is your First Aid program compliant? Posted on April 24, 2018 at 10:09 am. ANSI (American National Standards Institute) Minimum Requirements for Workplace First Aid Kits and Supplies (ANSI Z308.1) establishes the minimum requirements for first aid kit supplies. First aid kits are classified based on the assortment and quantity of first aid supplies intended to deal with most types of injuries and sudden illnesses that may be encountered in the workplace. Class A first aid kits are intended to provide a basic range of products to deal with most common types of injuries encountered in the workplace including: major wounds, minor wounds (cuts and abrasions), minor burns and eye injuries. First aid kits designated as Class A shall contain the assortment of compliant supplies in the quantities specified in the table below. Class B kits are intended to provide a broader range and quantity of supplies to deal with injuries encountered in more populated, complex and/or high risk workplace environments. First aid kits designated as Class B shall contain the assortment of compliant supplies in the quantities specified in the table below. Is your First Aid program compliant with the latest ANSI Standards? Posted on February 21, 2018 at 7:33 pm.